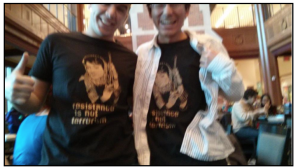 The Tower Magazineis reporting that two members of J Street U’s Washington University chapter donned T-shirts celebrating convicted PFLP terrorist Leila Khaled at a J Street U sponsored campus event last year. On August 29, 1969, Khaled was part of a team that hijacked TWA Flight 840 on its way from Rome to Athens. The T-shirts were emblazoned with an image of Khaled clutching an AK47 machine gun and the words “Resistance is Not Terrorism”. 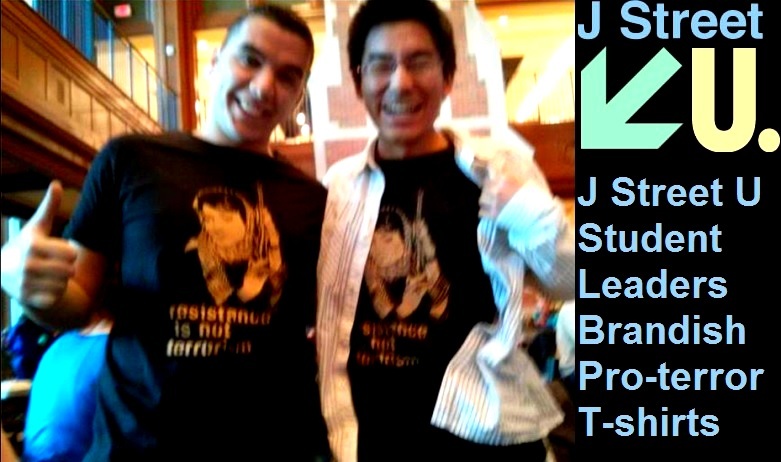 The allegations broke this morning when photos were discovered of the two students [Fadi AbuNe’meh and Taka Yamaguchi] wearing the shirts at an event sponsored by J Street U last April. In coverage of the event, AbuNe’meh is quoted as a representative of the group. In AbuNe’meh’s Facebook postings when asked where they acquired the shirts, he pointed to a vicious anti-Israel website called existenceisresitance.org.